If you or someone you know frequently gets behind on installing app updates on an iPhone or iPad, you may appreciate a feature in iOS Settings that allows the App Store to automatically update apps on the device. Just as it sounds, Automatic Updates for apps will periodically discover and find available updates for any installed iOS app on an iPhone or iPad, and then download and install those app updates automatically. This takes user involvement out of the updating process, as apps will just update themselves whenever updates become available. 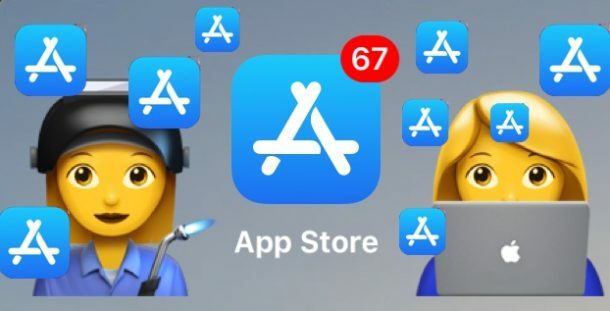 Automatic app updates in iOS is a great setting for people who want to maintain the latest versions of apps on their devices, but who routinely fall behind on manually launching the App Store to install updates directly themselves. For automatic app updates to work in iOS, the iPhone or iPad must be on a newer version of iOS system software, and the device must have an active internet connection, as without internet access the updates won’t be checked or downloaded. Now Automatic Updates for iOS apps has been enabled, and whenever updates are found in the App Store they will automatically install themselves onto the iPhone or iPad that has the setting enabled. The process is all handled in the background and aside from seeing the update indicators on app icons themselves, it’s rather seamless and most users won’t even notice the updates are happening behind the scenes. 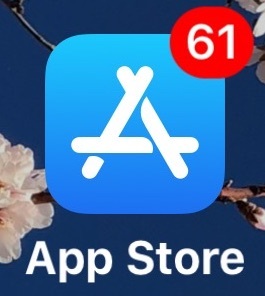 Once you have this feature enabled, you’ll pretty much never see the looming numerical red badge on the iOS App Store icon, which are used to indicate the amount of apps that are awaiting updates. Instead the updates just install themselves when possible, all automated and easy. Of course you an also choose to disable the automatic app updates feature of iOS and then just manually update all iOS apps on the device, or even just update apps independently on an individual basis, how you handle iOS App Store updates is up to you and how you use the iPhone or iPad. Note this does not apply to installing iOS system software updates, though another similar feature allows you to automatically install iOS system software updates as they arrive to an iPhone or iPad, which can be just as useful for some users. And of course while this applies to the iPhone and iPad, Mac users aren’t left in the dust. Mac users can enable automatic app updates as well as other automatic software updates, so if you find this feature useful on one Apple device you may well find it useful on your others as well. Do you have any tips or tricks for automatically installing app updates in iOS? Do you have any particular thoughts or opinions on the feature? Share your experiences in the comments below! Note that if you are limited on data, this uses cell data most of the time. I turned it off so I could update only when I had WiFi available. Plug in your iPhone and let it sit unused, like overnight while it is charging. It will update your iPhone apps automatically when the iPhone is connected to wi-fi and not in use. Much like the nightly backup routine with iCloud automatically. I’ve had this option turned on for years. Never has worked. Notice that under the Updates word, it says “new purchases.” It doesn’t say anything about other apps that are not new, thus you can’t expect it to update any of your existing apps automatically. I agree with all of the other post IT DOES NOT WORK!!!! Come On Apple, I am really getting sick and tired of Apples empty promises. This is just one of a long list of complaints. I have an “X” and I really don’t like it but my 7+ died & I didn’t really have a choice. 2. Hate Face ID works sometimes & sometimes NOT. 5. Crappie 💩 battery use my phone, listen to music connected to Car, grocery list app, Calendar, Contacts & Safari. I am a note taker, reminders all day long…. like I said I use my phone oh and of course Calls, Texting and Emailing. I start with a 100% battery I would have charged it the night before, and with in 2-3 hours I am down to 65%, 2 more hours and I am down to 20% and am needing to plug up….. hate it!!!! Please get a better battery for 2018 iPhone.